If any of your commercial, industrial or Residential holdings are located anywhere between Duncan to Bowser and as far as Coombs, B.C. 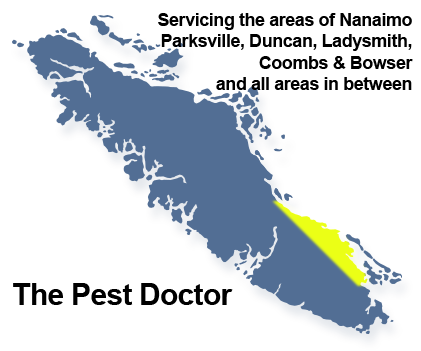 on Vancouver Island, we can help! Be assured that at The Pest Doctor, everyone of our staff and technicians are professionally trained to provide 100% customer satisfaction that will meet all your Pest Control needs. We are only a phone call away! Get in touch below with your pest problem or if you would like to get started with a contract.